Hostas are such beautiful plants, and are so versatile in the garden, that they are always attractive in my estimation. Primarily foliage plants, some of them have outstanding flowers, too, and add their own allure to situations as diverse as underplanting trees and shrubs, in the foundation planting, and in containers as well – as one innovative gardener illustrates. She names several, “fluctuans ‘Variegated,’ aka ‘Sagae,’” and Krossa Regal, which I must say, looks like a winner to me. My own choices are ‘Royal Standard‘ and ‘Frances Williams‘. It has clear green, very clean and fine foliage in a neat circle of medium size. 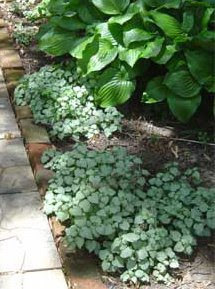 This uniformity of leaf gives it a strong presence when grown in the groups that display hostas so well. It has beautiful large white flowers, long lasting bloom which when paired with the clear green foliage give a classically beautiful appearance. It’s foliage stands up better to the elements than some other hostas, each year it impresses me, in dryish shade, during drought, in wet years…. it is dependable and good looking. I think that the variegated hostas give a texture and beauty to the garden, and they certainly are eyecatching, but there is a time and place for something solid and refreshing in color to the eye. Royal Standard excels in that niche. I love to see hostas as a trim along a house or a shady driveway. Sometimes variegation can be too much of a good thing, but when it is a tapestry of greens under trees or shrubs and seen from a distance, there is a beautiful texture that is very restful and interesting at the same time. Peaceful, but not boring. Hello Ilona. I enjoyed your post about hostas. They have long been a favorite of mine and I look forward to planting some again in my new garden. I really like the hostas too. Guess I’d better since I have mostly shade. I grow some of these varieties too. I think Halcyon is my favorite one that you named. Have you got your hands on Tony Avant’s ‘Outhouse Delight’ yet? He said it was the ugliest hosta ever. I had a little start someone sent me but it never took, and I’ve not been able to find another specimen. GardenJoy4Me- yes, slugs do take a bite out of the hostas beauty, but most years I don’t have too much of a problem- and I do think the variety is the difference in what looks good as promised. Coneflower- excellent tip! And yikes in response to NW slugs. Tina, Halcyon is one of the newer ones in my garden- but I think I will divide off some to make more this year. 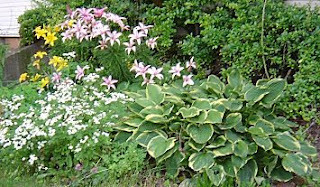 ( altho hostas hate disturbance – which I learned the hard way after being way too generous in giving “passalongs” to friends. I’ll leave a different favorites list here than I left on Margaret’s blog. That way I won’t feel like I’m neglecting so many of my favorites! ‘Candy Dish’ has been called the near perfect leaf by one of the hosta world’s gurus. I never get tired of looking at those heart-shaped, deep, glossy green leaves are ruffled edges. ‘Manhattan’ is a big one…ruffled leaf edges and wonderfully puckered leaf centers. The flower stems are a beautiful shade of rosy-pink as they emerge above the foliage! Ok…well, that didn’t work so well…there are so many others I want to mention! I have two large pots that sit outside an old barn. It was only yesterday that I decided for this year I’m going to plant them up with Hostas and then I find your post. I’m trying to obtain the copper strip to wrap around the top of the pots to deter snails but am finding it difficult here in France. The slugs and snails don’t like copper, it gives them an electric shock so they don’t cross it. What a treasure of ideas! Josh- your descriptions have given me the desire to try ‘Candy Dish’ and ‘Manhattan’…Bridegroom is in with Outhouse as conversation maker,which is actually kind of a fun idea for a dooryard bedding plan. Rob, I know the global markets have made copper a little scarce (altho prices have been down for a bit), but had no idea it could be used to deter slugs. Makes sense as it is used for electrical wiring. Also used for stained glass making- have you checked those sources for supplies? I’m hoping to plant these in the shady flower bed in the front yard this year, I think they’ll be my best option.